will always cheer you up! A cat calendar is a gift sure to be welcomed by any cat lover. There is a vast selection of cat calendars, so you will certainly find cat-inspired calendars to satisfy every taste. Some are funny, others are inspirational and all portray the beauty and majesty of cats. There are calendars that go from the definitely humorous, to the beautiful and uplifting, and from the cute and sweet, to the funky and jazzy. You can also create your own calendars. This is a fantastic way to express your creativity. Don't know where to start? No problem, below you will find several ideas. Maybe you want to make a cat and fish theme if you are an aquarium owner, for example. Another idea is to create a dog and cat theme. No matter what kind of day it is, a cat-themed calendar will surely cheer you up! So whether you you buy or make, a cat calendar makes a great cat lover gift. If you want to give cat calendars as gifts, please read on for lots of ideas and suggestions. Wall Calendars- These are great for the office. But don’t stop there, wall calendars are perfect for the home, too! Desk Calendars- Surely, these are perfect for the job or the home office. Boxed Calendars- There are unique and high-quality boxed calendars to satisfy even the most demanding of tastes. Large Calendars- A great idea, especially if you really need to remember those important dates. Small Calendars- A good idea is to give a small desk calendar or give one of those tiny calendars you can carry in your handbag or wallet. Magnetic Calendars- These are great for the fridge!!! I recently started a collection and I've found truly unique pieces. Pocket Calendars- To take with you everywhere. Planner- Great to keep everything neatly organized. … You can create your own calendars. Software programs such as Photoshop allow you to use pictures and graphics to create wonderful, professional-looking, custom-made calendars! For this project you can use your own kitty's pictures (or the pictures of your friend's kitty). Technology has made it very easy for us to create unique calendars. For example, you can have a cat calendar made at a store such as Staples. You can select the pictures you want, put the selected photos into a CD and then take it to a store such as FedEx Kinko’s or Staples to have it printed for a fee. Even better, these stores offer these services online. You can upload your favorite photos, graphics, or pictures, and select a design and style for your calendar. There are several online stores, in addition to the ones mentioned here, that allow you to make your very own customized calendars. You can use your favorite photos and graphics. You can select the size, type of paper, and style of your calendar. You can order as many as you want. You don't have to wait until January: you can start your calendar on any month. And, you can highlight all those special dates, such as birthdays and anniversaries. Some stores allow you to create collage calendars using different pictures. Decide before hand which pictures you want to use. Choose an "angle": You can make a calendar featuring photos of your kitty in funny poses, or you can decide to do "cat portraits" of your kitty, for example. If you have other pets, include them in your cat calendar. For an ultra-modern approach design a calendar with only black-and-white photos. If you have an artistic flair, use paintings of your cat instead of photographs. Photographs are great for making personalized calendars. And many online stores allow you to upload your own pictures. However, you can use other types of images, including drawings and (as previously mentioned) paintings of your cat. Choose a theme for your calendar: inspirational, fun, or nature-inspired, for example. For extra fun, make a handmade calendar. This is a great project for children. Include a calendar in a gift basket. Start a tradition and give a cat-themed calendar at the beginning of each year! Give a calendar along with another cat-inspired gift. If you don't want to make the calendar yourself, give a gift certificate to an online store so that your friend can create his or her very own calendar. 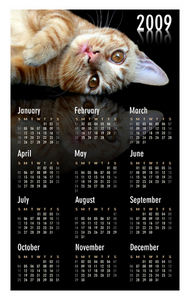 If you prefer to buy a calendar, many trusted online merchants offer a huge selection of cat inspired calendars. A cat calendar is an inexpensive and fun gift, and it will delight all your cat-loving friends.